Below are some pictures of how we spent July. We enjoyed going to the beach and riding on the boat. Every Thursday we went to the library for the kids' story time and craft project. We picked blueberries...a lot of blueberries. Tucker ate most of the blueberries he picked right off the bush. We went to the Yellow Duck Bakery and tried new muffins such as zucchini apricot. Yum! A couple of times we went to the Corner Bakery and got some donuts for breakfast...not so healthy, but a fun treat for the kids! Caroline and Tucker spent much of the summer riding their "big bikes." I created a town from sidewalk chalk that even included COTA, as Tucker said. 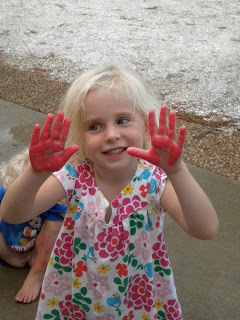 Did you know that sidewalk chalk + water = "paint?"